Just two months ago I told you about the Accell Thunderbolt 3 dock I was testing to provide added functionality to my Thunderbolt 3 equipped MacBook Pro. I had a Belkin Thunderbolt 3 dock to which I compared it. I really liked the Accell, especially for the price of $250, which was $50 less than I’d paid for the Belkin. I had to give the Accell back and I was sad because I lost ports going back to Belkin. When I posted the review of the Accell dock, Ryan Officer aka @CreatiVastARTS mentioned that he really liked his dock, the CalDigit TS3+. I looked at it and it looked great but I really had no excuse to get one. I reached out to them but didn’t hear back so I tried not to envy Ryan too much. But then something wonderful happened. Steve’s Belkin Thunderbolt 2 dock failed! That meant I could give Steve my Belkin dock, and get the CalDigit TS3+ for me! The CalDigit TS3+ is $301 on Amazon so it’s not an inexpensive purchase, but It has so many ports and it has the right ports, at least for me. In my Accell review I explained that the main problem I have is not enough USB-A ports. The CalDigit TS3+ has 5 USB 3.1 type A ports, which is more than any of the ones I’ve tested myself. Having 5 USB-A ports means I can leave a couple of Lightning cables plugged in, just in case I need them. It’s positively glorious. 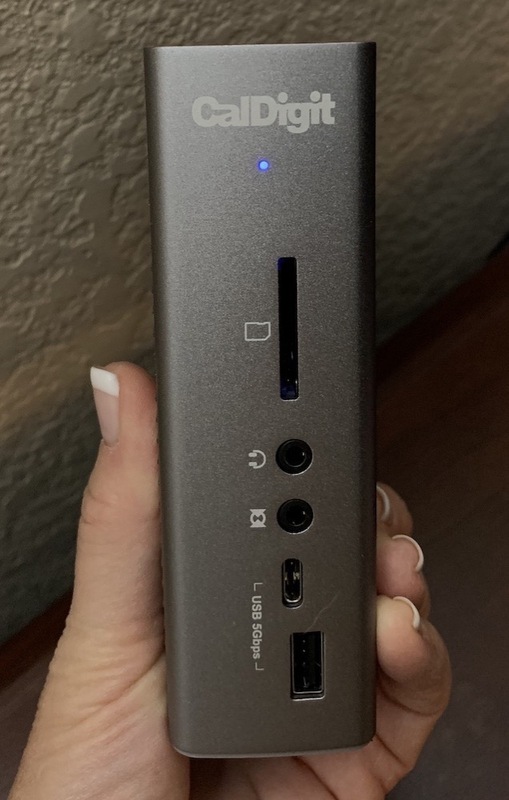 By the way, the OWC Thunderbolt 3 dock also has 5 USB Type A ports, but I haven’t tested it yet. OWC made some different choices, like using e-SATA on the device that I don’t like and is lacking in some other ports, but it’s a good deal at $255. One of the most attractive things about the CalDigit TS3+ (other than it’s gluttony of useful ports) is the size. Most docks are long and flat, which is actually an annoying shape to lay out on your work surface. The CalDigit TS3+ is wee tiny and can lay down or it can stand up on its edge. On edge it’s only 1.5″ wide by less than 4″ deep. In contrast, a dock like the Accell is 9.5″ wide and 3.5″ deep! Don’t let the diminutive size of the CalDigit TS3+ fool you, she’s mighty in what she can provide, Did I mention 5 USB type A ports? do you need more USB 3.1 ports? It also has 2 USB 3.1 Type C ports. That’s 7 total USB 3.1 ports. Crazy talk. I like how they’re distributed too. 4 of the USB type A ports are on the back, one on the front. 1 of the type C USB ports is on the back, the other on the front. Now let’s talk Thunderbolt since that’s why we’re here. 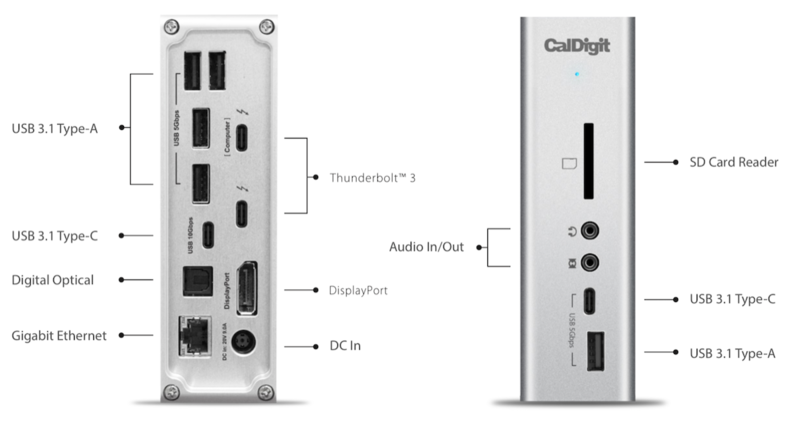 The CalDigit TS3+ has 2 Thunderbolt 3 ports. One is clearly marked “Computer”. I should mention that every port is clearly marked. With the other docks I’ve tested, it was sort of a guessing game to figure out which port provided which function. Since Thunderbolt 3 and USB 3.1 both come out of USB-C ports, it’s very important to have the markings be clear. The Thunderbolt 3 ports have a lightning bolt (or I guess that’s a thunderbolt, right?) and the USB 3.1 port on the back says USB 10Gbps. Interestingly the USB 3.1 port on the front says 5Gbps so keep that in mind if speed is your highest priority. I plugged my MacBook Pro into the Thunderbolt 3 port labeled Computer, and then the 5K LG display into the second Thunderbolt 3 port and it works perfectly. By the way, the CalDigit TS3+ will support the one 5K display, or two 4K displays. The CalDigit TS3+ will also charge your laptop at up to 85 watts, which is close enough to the 87 watts the beast of a 15″ MacBook Pro requires. I love having just the one cable from my Mac to the dock, and then let the dock do all the heavy lifting after that. After a while using the CalDigit TS3+ I started to get an error saying that a USB device was using too much power. I’ve seen that on other docks too, and never been able to track down the root cause. I did a search on the CalDigit support pages and learned something really interesting that the CalDigit TS3+ can do. The support article explained that you can use an iPad Pro with the Type-C port directly to both transfer data and charge the iPad Pro. But if you try to do that out of the box you’ll get this USB power warning problem I’ve been seeing. I’m not charging an iPad Pro with my dock, but I do have a Qi charger for my iPhone and perhaps it’s not quality charger (I think I paid $12 for it) and it’s drawing excessive power. In any case, this support article talking about charging an iPad Pro came with instructions to install the “USB Charging & Superdrive, iPad, iPhone Support Driver”. I figured this might solve my problem so I installed the extension. The good news is I’m not getting errors any more with my iPhone sitting on the Qi charging dock. Let’s do a stress test and plug the 12.9″ iPad Pro into the CalDigit TS3+ via USB-C too and see what happens. Well, the iPad launched iTunes to sync and began charging and I didn’t get any power warnings at all. For about 5 minutes. Then I got the power warning. I unplugged the iPad Pro figuring it pushed it over the edge, but left the Qi charger plugged in and waited. Without the iPad Pro adding to the USB charge load, all was good and I didn’t see the USB charging warning again. You know I’m not a fan of reading manuals but the manual for the CalDigit TS3+ is really well written and organized and explains things quite well. Their support article for this issue was very well done, with good screenshots and explanations of why you’d want to install the driver in the first place. I do kind of wish there was a way to peruse the support articles though. You have to keep guessing on what search term might get a result. If you guess wrong, there’s no indication of other articles and subject that might help. The CalDigit TS3+ comes with gigabit Ethernet and Digital Optical out. I’ve never once used Digital Optical but perhaps someone out there needs it. On the front there’s a headphone jack which is of course essential to me. I’ve had a few problems where my system doesn’t seem to recognize the headphone jack on the CalDigit TS3+. I haven’t figured out if it’s a hardware problem with the dock itself, or whether it’s the experiments I’ve been doing with a couple of Rogue Amoeba apps. I’m trying to learn the new Loopback 2 and changing all of my connections in Audio Hijack and it’s been a bit rocky as I learn the new tool. I’m 90% certain it’s the software interaction but I wanted to throw it out here just in case. One of my favorite additions with the CalDigit TS3+ is the inclusion of a UHS-II SD card slot. It’s one of those really satisfying ones where it’s spring loaded as you shove it in so you’re sure you have it successfully inserted. None of the other docks I’ve used have sported an SD card slot so I’ve had to use a little USB hub when I use my big-girl camera. CalDigit TS3+ has a docking utility app you can install if you choose. The problem it aims to solve is how annoying it is to have to eject every single mounted drive separately from your Mac before disconnecting from the dock. I only keep one drive mounted so I haven’t installed and tested the utility, plus I have the same capability via Parallels Toolbox when I need it, but cool that they supply it too. You may be wondering why I have been so precise in always calling this dock the CalDigit TS3+ instead of just CalDigit. That’s because on their website they talk about the CalDigit TS3, and the TS3 Lite. As far as I can find these docks are no longer for sale. The TS3 had eSATA ports and I guess those are no longer de rigueur now that we have Thunderbolt 3. And I still have two open USB-C ports, a full-sized Display Port so I could plug in my Apple Cinema Display and that mysterious Digital Audio out port that I’ll use some day. Been a while since we had the “how to not blow up your battery discussion while preserving its longevity.” You mentioned the cheap Qi charger and your expensive iPhone? The not cheap (but not expensive) Samsung charger that matched my Galaxy S7 was supposed to be smart, meaning it and the phone (worked together) to protect the battery as it sits on the charger. If the cheap Qi charger is drawing enough power to trip a warning (before installing the driver), is it possible it isn’t moderating power feed when the phone is full? Macs communicated with Apple OEM chargers to protect themselves, which is how it was possible to charge an 11″ Air (45 watt OEM charger) from the 85watt MacBook Pro charger without exploding the Air. Crappy third party Mac chargers didn’t do that. So just a “heads-up” about that $12 Qi?